Deep brain stimulation has been used to treat Parkinson's disease symptoms for 25 years, but limitations have led researchers to look for ways to improve the technique. This study describes the first fully implanted DBS system that uses feedback from the brain itself to fine-tune its signaling. The study was supported by the National Institutes of Health's Brain Research through Advancing Innovative Technologies (BRAIN) Initiative and the National Institute of Neurological Disorders and Stroke (NINDS). "The novel approach taken in this small-scale feasibility study may be an important first step in developing a more refined or personalized way for doctors to reduce the problems patients with Parkinson's disease face every day," said Nick B. Langhals, Ph.D., program director at NINDS and team lead for the BRAIN Initiative. Deep brain stimulation is a method of managing Parkinson's disease symptoms by surgically implanting an electrode, a thin wire, into the brain. Traditional deep brain stimulation delivers constant stimulation to a part of the brain called the basal ganglia to help treat the symptoms of Parkinson's. However, this approach can lead to unwanted side effects, requiring reprogramming by a trained clinician. The new method described in this study is adaptive, so that the stimulation delivered is responsive in real time to signals received from the patient's brain. 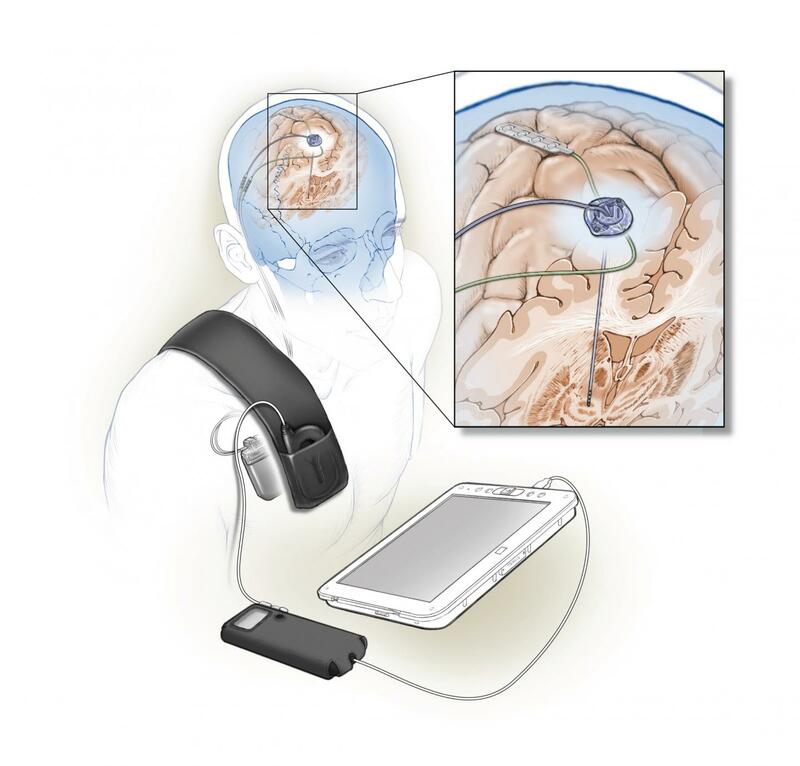 "This is the first time a fully implanted device has been used for closed-loop, adaptive deep brain stimulation in human Parkinson's disease patients," said Philip Starr, M.D., Ph.D., professor of neurological surgery, University of California, San Francisco, and senior author of the study, which was published in the Journal of Neural Engineering. In a short-term feasibility trial, two patients with Parkinson's received a fully implanted, adaptive deep brain stimulation device. The device differs from traditional ones in that it can both monitor and modulate brain activity. In this work, sensing was done from an electrode implanted over the primary motor cortex, a part of the brain critical for normal movement. Signals from this electrode are then fed into a computer program embedded in the device, which determines whether to stimulate the brain. For this study the researchers taught the program to recognize a pattern of brain activity associated with dyskinesia, or uncontrolled movements that are a side effect of deep brain stimulation in Parkinson's disease, as a guide to tailor stimulation. Stimulation was reduced when it identified dyskinesia-related brain activity and increased when brain sensing indicated no dyskinesia to minimize deep brain stimulation-related side effects. Results of initial, short-term studies aimed at demonstrating feasibility and effectiveness of using adaptive deep brain stimulation to overcome the impediment to movement of Parkinson's suggested that this adaptive approach was equally effective at controlling symptoms as traditional deep brain stimulation. Doctors saw and patients noticed no differences in the improvement in movement under adaptive stimulation versus constant, open loop stimulation set manually by the researchers. Because adaptive deep brain stimulation did not continuously stimulate the brain, the system saved about 40 percent of the device's battery energy used during traditional stimulation. The short time periods over which movement was assessed did not permit comparison of the two deep brain stimulation paradigms relative to incidence of dyskinesia, but it is hoped that the variable stimulation will also translate into a reduction in adverse effects when tested over longer time periods. "Other adaptive deep brain stimulation designs record brain activity from an area adjacent to where the stimulation occurs, in the basal ganglia, which is susceptible to interference from stimulation current" said Dr. Starr. "Instead, our device receives feedback from the motor cortex, far from the stimulation source, providing a more reliable signal." Many patients with Parkinson's disease who would benefit from deep brain stimulation are difficult to treat because too much stimulation can cause dyskinesia. Thus, finding the correct level of stimulation is like trying to hit a constantly moving target. An adaptive system like the one being tested here could offer an effective alternative and may also limit adverse effects of traditional deep brain stimulation, but considerable testing remains to be done. "Here we have demonstrated the feasibility of adaptive deep brain stimulation," said Dr. Starr. "We are now planning larger, longer-term trials to determine how effective this system is in managing the symptoms of patients with Parkinson's disease." This study was supported by the NIH's BRAIN Initiative (NS100544), the NINDS (NS090913), the UC President's Postdoctoral Fellowship, NSF EEC-1028725, and a NDSEG graduate fellowship. The NIH's Brain Research through Advancing Innovative Neurotechnologies® (BRAIN) Initiative is aimed at revolutionizing our understanding of the human brain. It is managed by 10 institutes whose missions and current research portfolios complement the goals of the BRAIN Initiative: NCCIH, NEI, NIA, NIAAA, NIBIB, NICHD, NIDA, NIDCD, NIMH, and NINDS.